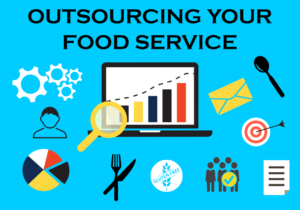 What to Look for When Outsourcing Your Food Service. Selecting a food service management company is an important strategic decision for your camp for a plethora of reasons. Your food service provider will not only manage the food service for your camp but will also indirectly exhibit one aspect of your camps identity to staff, guests, campers and parents. Since this vendor will impact a huge facet of your camp, it would be effective if the executive management team took a strategic approach in it’s selection. Benefits of Outsourcing Camp Food Service for Your Organization. Return on Investment, more free time and a healthy well-balanced menu are just a few of the many tangible benefits that accrue when a professional food service management company has been chosen to manage your camps kitchen. Intangibly, the right food service provider can become an important component of high staff and camper satisfaction which in-turn makes a strong contribution to the overall success of the camp season. Frequently it is much less expensive for your camp to hire an outside company to handle its food service operations. From a cost-of-staffer perspective, not only does the company save on wages and benefits, it also saves on the time it would take to hire and train employees to work in a camp kitchen. These costs are easy to document and can be calculated not only in a dollar and cents savings, but also in the time saved by not having to deal with this aspect of managing a kitchen. Most food service vendors will have an onsite manager to oversee the operation, including employee management functions. This manager will administer, either locally onsite or through an administration system at the vendor's corporate office, all wage and salary items, employee hiring and replacement and numerous personnel responsibilities. This increases your camps leaderships team productivity by diverting food service personnel tasks to your chosen provider. Additionally, labor laws relative to food management and local and state food purveyance rules and regulations are extensive, require strict compliance, and seemingly change often. Relying on a third party to stay abreast of these laws and regulations saves your company time and money as well as minimizing company liability along with reducing liability insurance premium costs. Leadership staff are under great pressure to continually deliver a high quality, safe, exciting and memorable camp experience. Spending leadership time managing the kitchen/dining hall, food purveyance and food service employees rather than spending time growing your business, is not time well spent! Camp food service is moving in the direction of increased emphasis placed on health and the nutritional value that comes in the food served. Your campers and staff expect to have options in their food menus that not only deliver variety on a regular basis, but also are designed so they are healthy as well. Most campers and staff will typically consume several meals plus snacks and drinks during a normal day in the camp environment. In addition to providing tasty, well-balanced, appetizing and affordable food, the food service vendor must provide healthy choices for meals and snacks. The offerings should favor quality ingredients, whole grains, low-sodium, minimally processed, trans fat free, gluten free, vegetarian, and other dietary restrictive items. Healthful food at camp is a benefit that will pay long term dividends with daily staff and camper energy levels, better overall general health and a better experience at camp for all. Selecting the food service company. After you have understood from the food service provider what they can offer, how they will offer it and how they will work with you, you will need to make some decisions. Sometimes the choice of vendor will be evident, and the executive team will be in agreement regarding the selected vendor. If the decision is still close between multiple vendors, develop a series of follow-up questions that will help solidify the decision or ask each vendor if there is something else that could be done to reduce the initial investment, minimize operating costs, or include an additional service without increasing the bottom line. It is important that your team chooses the food service provider that is most likely to meet both your current and future needs. Additionally, it is important that the chosen vendor is best aligned to your needs and has the ability to deliver the services you were seeking. In short, the chosen provider should have the ability to become a great long-term partner for your camp. Enjoy the benefits of using a food service provider. Once the details have been ironed out and contract has been signed, your camp will be ready to enjoy the numerous tangible and intangible benefits. From an increased ROI to improved efficiency and time savings to camper and staff satisfaction, you will soon be questioning why you didn't seek a food service provider earlier. Through a thoughtful, systematic approach you can and will find the food service provider who can help you meet your current and future food service needs. In short, with the help of a food service company, the leadership team can focus on the camps most important and strategic tasks rather than worry about the time-consuming day-to-day operations of the kitchen. Leave these operational tasks to your chosen food service provider so that your camp can focus on providing an experience that changes a camper’s life forever.